I remember when I was a newly promoted sales manager at a computer store in Evansville, IN, and a newer sales rep named Jeff was telling me about his first really big sale. Sadly, I have to report that I didn’t take my eyes off my work as I listened (I thought I was listening) to Jeff go on and on about the details of his sale and the great margin he was able to achieve on the sale. The margin was just over 30%, which was really incredible. When Jeff was finished, before I said anything else and without making eye contact, I asked one question… “Did you sell them a box of paper?” There was a moment of silence and then I heard Jeff start to cry. Luckily, Jeff overcame that moment of my leadership ignorance and I pray I’ve learn much since that day to be a better, a more co-worker friendly and inclusive leader. Jeff became a really good sales person, one of the best in the store. I’ve learned it’s better to have fun while leading. 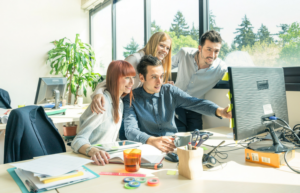 Additionally, having fun is a key ingredient of keeping employee morale up, and inspiring people to continue to work aggressively toward a common set of goals and objectives. There is a type of leadership called inspirational leadership. Having FUN in the workplace. As a leader, you might be thinking that “FUN” is important, but it cannot be paramount in terms of achieving results. I’ll challenge you on that train of thought with one caveat. It’s important to not just think of having fun in terms of the “webster” definition. As a leader, YOU need to define fun, and communicate YOUR definition of fun to your team. First, let us lay the foundation with a bit of “FUN – philosophy” as we work toward our own definition of “Leadership Fun in the Workplace”. There is a huge difference between highly successful leaders and those leaders who are working incredibly hard, but not quite achieving the same level of results. The difference is in leadership styles. What do I mean? The highly successful leader today facilitates, leads by example, encourages and participates with their team members to achieve TEAM results. John Maxwell says it this way, “A leader knows the way, shows the way, and goes the way.” When the entire team feels fully engaged and a part of the process, then every team member takes personal pride in achieving the results. Having FUN along the way supports engagement of each team member. Try thinking about it this way, being “engaged” is fun. Let’s be frank, the days where the leader is a strong authoritative director and where all employees simply wait to see what the manager tells everyone to do does NOT produce the results that are recognized by a fully engaged team. The leader may be having fun, but his/her subordinates certainly are not. Managers who want to micro-manage all the details are finding that it is virtually impossible to do. The marketplace simply demands too much for one person to micro-manage their team. We all have incredible people working for us, and if we are effective leaders we need to create an environment where every employee feels like they are empowered, and understand they are expected to proactively contribute. Okay, let’s get to our definition of Leadership Fun in the Workplace. FUN is NOT always laughing, being light-hearted, having low stress, and being comfortable. Quite the contrary – FUN is: Working in an environment where people are challenged, they learn new skills, they grow, they seek opportunity and advancement, they take risks, they ask forgiveness – not always permission. People with these traits make an organization grow and thrive – these people succeed more often than fail – and ultimately reap the rewards and recognition of one who consistently achieves results. They stay motivated with the knowledge that they are the exception to the common rule of human behavior. All told, they are having FUN because they make a difference and a contribution – they simply do not allow themselves to settle for the status quo. They would rather experience “engagement” – because being engaged – is FUN! Include your team to engage them. Hold your team accountable to get buy-in. Give specific and timely feedback to develop them. Catch them doing things (something, anything) right! Do these things and watch your results increase.